Our web (GUI) based messaging platform allows users to deliver bulk marketing voice broadcasts to thousands of your customers in just few minutes, or use our easy-to-use web GUI to send voice alerts, notifications or reminders to smaller groups or single recipients. 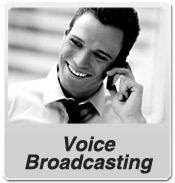 Voice messaging never has been easier - simply record or upload your sound file (wave or mp3 format), enter or upload list of the phone numbers, and quickly send or schedule your broadcast. You will be charged only for delivered messages. We don't charge for call that didn't go through or were not answered. All land line phone carriers in North America are supported. Final delivery of our bulk voice broadcast is achieved via analog phone lines of highest quality, rather than by low-bandwith voice-over-ip method. 2. Single recipients and groups supported. 3. 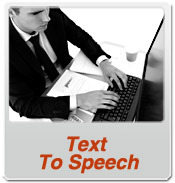 Text To Speech engine - send text-to-voice message to land line or cell phones. 4. 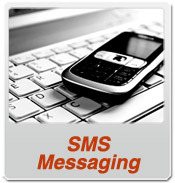 One-click quick Text-to-Speech sending to a recipient or a group. 5. 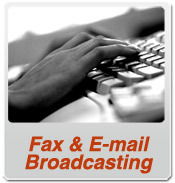 Broadcasting to multiple recipients/groups (sms/voice/fax/email). 6. Scheduling broadcasts up to one week ahead. 7. Support for thousands of recipients and groups. 8. User friendly and robust web based GUI - nothing to install on your PC. 9. Quick Voice delivery - it takes seconds, not minutes. 10. Delivery of thousands of messages within few minutes. 11. 2-Way capabilites - capture recipients response (e.g. 'Pressed 1') to your voice/tts messages. It is possible to send Voice or TTS message, that would ask the recipient to make a choice by pressing a number on the dial. The recipient would listen to the message, and then press 1, or 2. The number pressed will later show up in the message status, so it will be easy for the sender to see and handle recipient's response. Text to Speech (TTS) option included in every mothly plan, helps to convert text message to high quality voice, and deliver it to land line or cell phones. This option is very useful for all kinds of alerts, when you want to push out your message quickly and without thinking what kind of receiver(s) (sms capable cell phone or voice-only capable phone) are you dealing with. The whole process is totally transparent to the user. Virtual Mobile Phone Numbers can be used for incoming voice calls. Imagine sending an SMS using your virtual number (that's your caller ID) - your recipient receives it, and decides to call you back. 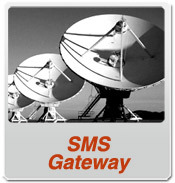 Our system will receive such calls, and redirect caller to your real phone number. Each Silver/Gold account comes with one Virtual Mobile Phone Numbers included, additional number can be purchased separately. Please contact our support team if you need virtual mobile number to be set up for your account.